A wellness and recreational holiday in SalzburgerLand is always connected with wonderfully soothing but also invigorating natural surroundings. Accordingly, the basis of most wellness and beauty treatments involves natural products. And there are quite a few of them in SalzburgerLand! Fresh spring water, herbs, hay flowers, honey, stone pine – all these natural remedies can provide a contribution to your well-being. The characteristics of stone pine – also called “Queen of the Alps” – and its positive effects on the mind and body have already been known for many centuries. The warm, mild fragrance is slightly reminiscent of vanilla and frankincense. It is not only very pleasant, but also extremely long-lasting. A scientific study also documented that the specific ingredients of stone pine have a healing effect on the human organism. The heart rate is reduced and circulation is stabilised. Both factors contribute to more rest, recovery and regeneration. The 4-star Hotel Steiger in Neukirchen am Großvenediger is completely dedicated to stone pine. Among other things, all bedrooms in the newly built studios and suites are completely furnished with stone pine. Guests of the “Hohe Tauern Health” initiative rest in beds made of stone pine, additionally inhale the therapeutic fragrance of the pillows filled with stone pine shavings and enjoy extremely relaxing sleep. Stone pine is also ideally suited for sauna construction. Due to the high percentage of resin and the retained essential oils as well as the antibacterial property of stone pine, a sauna session in a stone pine sauna has an even more positive effect on well-being. Numerous hotels in SalzburgerLand offer their guests this very special wellness experience. The Children’s Hotel Felben in Mittersill for example or the Vital Hotel Post in Dienten or the Puradies in Leogang. Anyone who would like to learn more about stone pine and find out about the uniqueness of this tree for themselves should hike the Zirbenweg (Stone Pine Trail) at Graukogel in Gastein. The mostly flat trail leads past an age-old population of stone pine with partially over 400 year old trees. A stone pine bed, stone pine swing and stone pine bench invite hikers to take a break on the way. Honey is a treasured treat but also well-known as a natural remedy. People in the Stone Age already used it to sweeten their food. 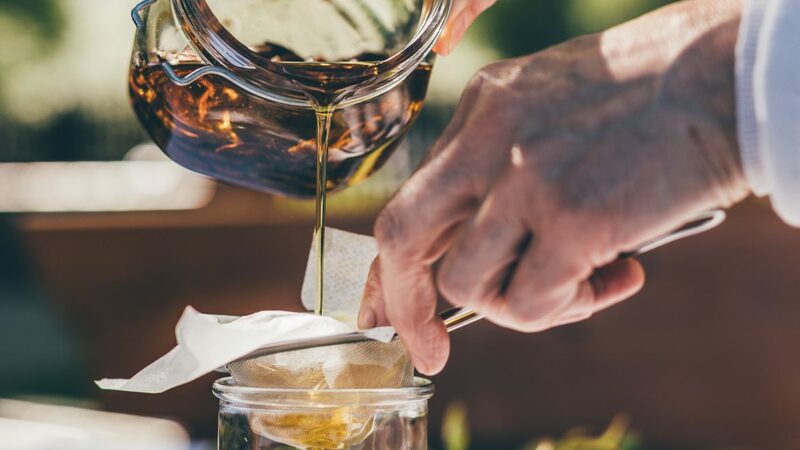 Nowadays, physicians also know that honey has an antibiotic and antibacterial effect, and is of good help against inflammations and with wound healing. And any child loves good a glass of warm milk with honey to help with falling asleep! Meanwhile, the cosmetics and wellness sector has also discovered the beneficial attributes of honey. At Tauern Spa Kaprun, you can enjoy a massage with Salzburg mountain honey and thereby stimulate the detoxification of the body. The organic honey embrocation with precious blossom honey at the Aqua Salza spa in Golling has an invigorating and disinfecting effect on the skin. Or how would you like to have a honey peel for well-groomed, clean skin? This is for instance offered at the Bio Vital Hotel Sommerau in St. Kolomann. There are large quantities of medicinal herbs on the untainted, lush alpine meadows in SalzburgerLand. Knowing all about them, however, and using them correctly is another matter. 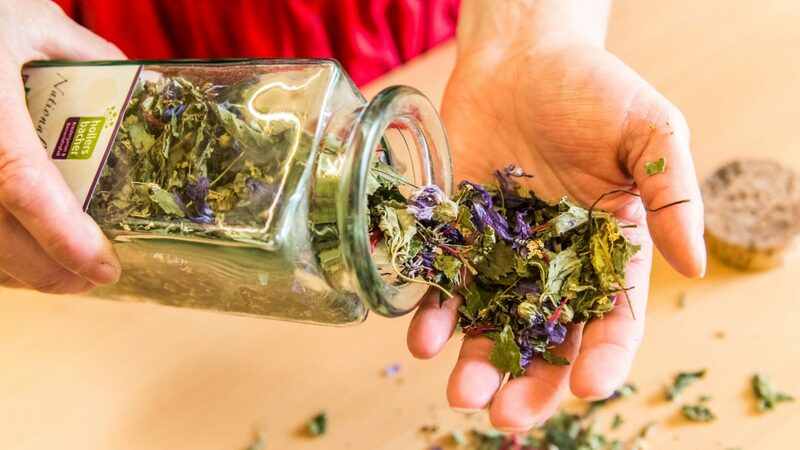 Fortunately, there are enough “herb witches” who know which plants are suitable for teas, inhaling, rubbing in, as well as for infusion and aromatic oil and much more. At any rate, one thing is certain: only if the right herbs are properly used can they exert their full effect. Anyone who would like to know more about medicinal herbs in SalzburgerLand can read the German-language magazine article about the power of medicinal herbs, “Die Kraft der Heilkräuter”. The 4-star Holzhotel Forsthofalm in Leogang stands for alpine wellness in the mountains. The unique SPAnorama is located on the roof of the alpine lifestyle hotel. Here you can feel the power of alpine herbs, for instance in the organic herbal sauna, the saline steam bath, the heated bench with footbath and naturally also with various relaxing treatments. While looking out into the natural surroundings you can also immediately see where the wonderfully fragrant, hand-picked herbs come from. The 4-star superior Eggerwirt Wellness Hotel in St. Michael im Lungau also relies entirely on the power of the Alps (and its herbs). Only products from Alpienne are used in the cosmetics and treatment area. Medicinal herbs from pure ecological mountain pasture cultures are utilised for this natural cosmetics range. Eggerwirt guests enjoy resounding treatments such as the Balance Alpine “Genussgipfel” (“Summit of Pleasure”) body massage or the Balance Alpine “Gedankenfreiheit” (“Freedom of Thought”) facial massage. An herbal stamp massage – such as at the 4-star Johannesbad Hotel St. Georg in Bad Hofgastein – is extremely therapeutic and relaxing. Hot, bound lavender blossoms – whose moisturising active ingredients are massaged into the skin – are utilised for this treatment. A lot of work has to de done by the farmers until the hay is ready to manifest its health enhancing effect. Fragrant hay is not only healthy for animals as fodder. Countless active ingredients are in a handful of hay flowers. Hay can for example be used to help with rheumatic complaints, but the fragrant aroma also simply helps to alleviate stress. So it’s time to take a hay bath! Warm hay unfolds its wonderful fragrance in the so-called Kraxenofen (a hay steam bath) in the wellness oasis at the 4-star Drei Brüder in Unken. Regardless of whether you have back pains or not, the warming feeling is pure relaxation. A hay flower pack at the 4-star Pleasure & Vitality Hotel Moisl in Abtenau has an invigorating and purifying effect. The utilised hay from blossoms and grasses of course stems from unfertilised alpine meadows. The essential oils within the hay flowers unfold their complete effect during the treatment. When a farm is described as a “Heubadehof” (“hay bath farm”), it is clear what is expected here. At the Heubadehof Pürzelbach in Weißbach bei Lofer, guests can enjoy a fragrant, relaxing and purifying bath in hay throughout the year. And after sweating, you can naturally enjoy a tea from genuine hay flowers! Granted, it takes a bit of effort for people to dare to take the plunge into ice-cold water. But the pleasant feeling afterwards and knowing about the health enhancing effect of taking a Kneipp (hydrotherapy) cure makes it all worthwhile. Taking a Kneipp cure has been proven to stimulate the circulation, blood flow and metabolism, and it is also invigorating! It is easy to refresh yourself in cold water and also do something good for your health in SalzburgerLand. Next time you pass by one of the crystal-clear, gushing springs and mountain streams while hiking, you know what has to be done: simply take off your shoes and socks and step into the watery pleasure! SalzburgerLand’s 4-star Hotel Hammerschmiede in Anthering is Austria’s first certified Kneipp hotel. The original Kneipp facility directly in front of the hotel is supplied with fresh spring water. You can walk across the forest meadow wet with dew in the early morning, guided by the swooshing sounds of the nearby waterfall. A water treading pool and a facility for pouring water is also on offer. If the parents are having a good time, the children also want to be pampered! Just like it is for the adults, there are also quite a few offers for the up-and-coming aficionados. Kids can work up a sweat in the cabin sauna at the 4-star Waldhof children’s hotel in Grossarl. The 4-star Seitenalm family hotel in Radstadt pampers babies, kids and teens with special massages. The “chocolate pack” also sounds wonderful, but this time, the chocolate cannot be eaten. Since girls and boys have different needs, the 4-star superior Palace Hotel Lacknerhof in Flachau offers a fruity facial treatment for little princesses and a sporty massage for boys. A few years ago, wellness was considered for women only. Men have now also realised the relaxing effect of a wellness holiday. Numerous hotels have recognised the trend and offer appropriate programmes. One example is the 4-star superior Krallerhof in Leogang. The fabulous “pampering day” especially for men includes a facial treatment, manicure, fango (mud) pack as well as a full-body massage. You can enjoy a very special kind of wellness pleasure at Tonibauer Alm. Get comfortably settled in the HOT POT – a wooden tub made of larch wood from the Lungau region – and enjoy the pleasant warm water and the view of the mountains all around.